For every one roach you see, there are 30 living in your walls. They carry 33 different diseases and infections. One pair of German cockroaches could grow to a massive family of more than 100,000 in just 3 months. German cockroaches rely on you to provide food and water in order for them to survive. Pest Solutions 365 can determine the size of roach infestation and pest control needs of your home with a professional pest audit. Only $25 for a 20-minute inspection. Getting rid of roaches usually requires professional attention. Although sprays and home treatments may provide temporary relief, we highly recommend you call Pest Solutions 365 as soon as possible so we can permanently get rid of the roaches. Make sure all of your counter tops, cabinets, floors and window seals are free of any food crumbs and water. 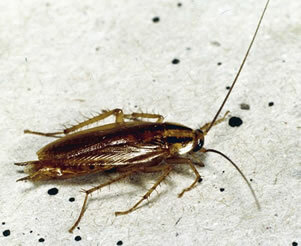 Roaches multiply very quickly on high-protein diets. Make sure to dry all counter tops and sinks after use. Remove all cardboard, egg containers and paper sacks from your kitchen. Do not forget items stuffed behind the refrigerator. Vacuum your cabinets thoroughly (and throw away the vacuum bag). This will not only remove food from the cabinets, but also the roach egg capsules. Each egg capsule can hold up to 30 eggs inside.